18+ New Online UK+IRE players. Paypal & some deposit & bet types excl. Min first £5 bet within 14 days of account reg at min odds 1/2 = 4x £5 free bets. Free bets valid for 7 days, stake not returned. No cashout, restrictions + T&Cs apply. How to Register a New Account on Coral? Opening a new account is pretty easy and costs nothing. The first thing you need to do is open the website of Coral. You will see a green “Join Now” button in the top right corner of the page. Simply click on it and the registration form will open. You will be asked to do a couple of things. For a start, fill in some personal details such as name, address, phone, email, and country. You will also have to pick a username, password, currency, and a couple of other stuff. It’s interesting to note that Coral also offers a quick PayPal registration. If you have an account with the e-wallet, it takes only a couple of clicks to join the bookmaker as well. 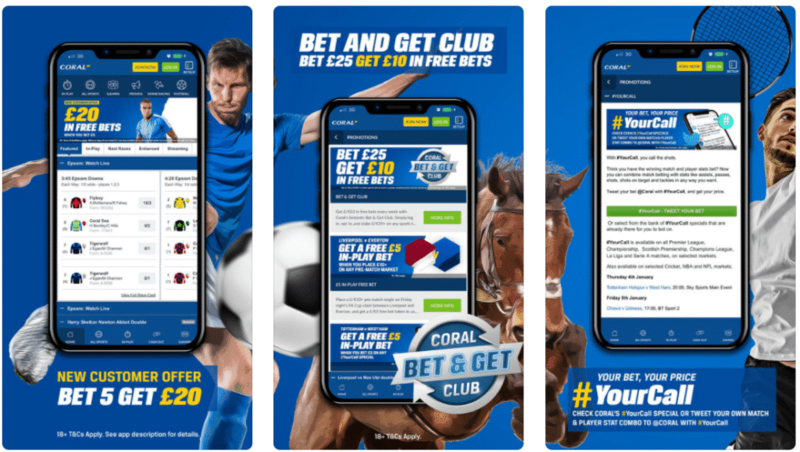 Bet £5, get £20 in FREE Bets: If you are interested in the sports betting section of Coral, you could get £20 in free bets easily. Simply open a new account, make a deposit, and place £5 on any sport. Coral will immediately credit your account with four free bet tokens worth £5 each. Free bets codes are also known as “Voucher Codes” available in the “My account” section of the site. Your voucher code will be live-checked by the site. A Goal to be Scored 50/1: This is the other promotion of Coral that is for new customers only. If you don’t like the free bets they offer, you could go for A Goal to be Scored at odds of 50. The bookie offers that on a regular basis by picking popular football games, mostly from the English Premier League. The maximum stake you can place is only £1, but on such crazy odds, this would mean a return of £50. On top of that, if the game ends 0:0, Coral will give you a £5 free bet. Simply put, there’s no way to lose with this promotion. In order to take advantage, you have to open a new account and make a deposit. Then, go to the game selected for the offer by Coral. Place your first bet ever on the “A Goal To Be Scored 50/1” in “My Markets” section. Your Call Specials: Coral has an interesting promotion called Your Call specials. It allows you to pick a bet that is not offered on a certain match and tweet to the bookie. It will then give you a price and the chance to place a wager on the market you selected yourself. The competitions included are the English Premier League and Championship, the Champions League, the Spanish La Liga, the Italian Serie A. Your Call is also available on selected games from the NBA. 4+ Acca Boost: If you’re a fan of accumulators, this Coral promotion is perfect for you. Each time you place at least £2 on 4 or more football selections and win, you will get a 10% boost to your return. The extra cash will be credited to your account as free bets. It won’t take long for anyone to become comfortable with the website of Coral. All sports and markets can be reached quickly, thanks to the smooth navigation. The bar on the top is a quick way to reach any part of the Coral platform, while you will find the list of the sports available on the left. There’s also a customizable bar that will help select favorite leagues and add links for quick access. Another advantage is that the bookie has some quite interesting side features. For example, you can settle your bets before an event is finished thanks to Cash Out. You could also watch plenty of games in various sports thanks to the live streaming service of Coral. Even when a match is not covered, chances are you can get updates by listening to the Coral Radio. Rugby: all games from both the Rugby League and the Rugby Union are available. The full betting coupon of Coral includes more than 25 other sports too. The best news is that you can place your wagers both pre-game and live on most of them. The odds are slightly better than the industry average and Coral accepts pretty large limits, especially when it comes to mainstream sports and leagues. Other options: you can use prepaid cards such as Paysafecard or other options, depending on your country. The Help section of Coral’s website provides plenty of information. You can learn more about the different products of the company, payments, promotions, and pretty much anything related to the services of Coral. If you need further assistance from the customer support team, you can get it in a couple of different ways. Probably the most convenient among them would be to start a live chat. An agent will be there almost instantly and will politely resolve your issue. You could also send an email or call the staff. Windows Phone: there’s even an app for Windows Phone that is available in the corresponding app store. While the app for Windows Phone requires some work, the other two are of exceptional quality. The design and user interface make sure you’ll have a comfortable experience on mobile. Most importantly, Coral included its full betting coupon and all major features in the three native apps. Mobile Responsive Website: If you have another device or simply don’t want to use the memory of your phone or tablet, you could always go to the mobile-responsive website of Coral. It will instantly detect the best possible settings for your phone or tablet and adjust to them. As a result, the graphics are good-looking, while the navigation is pretty smooth. Similarly to the native apps, you get the full package with the Coral website on the go. Coral was founded way back in the beginning of the 20th century which makes it one of the oldest bookmakers out there. The company was focused on providing betting opportunities across the United Kingdom for decades. When the Internet came around, Coral was quick to jump on board and offer its own online platform for sports betting and other gambling products. The company is still going strong today, so we decided to create this review of the main promotions offered by Coral. Coral has a long history of success when it comes to gambling. The company has certainly managed to transfer the experience online and currently offers an impeccable betting platform. You will find all kinds of promotions and a large betting coupon with all kinds of sports and events. On top of that, Coral is making sure to stay ahead of the competition with side features such as the live streaming of games and reliable mobile apps. Another advantage of the operator is that it has a full portfolio of gambling such as poker, bingo, and casino as well. There’s a reason plenty of people believe Bet365 is the best bookmaker online. The company offers one of the largest betting coupons on the market, as well as the most competitive odds. 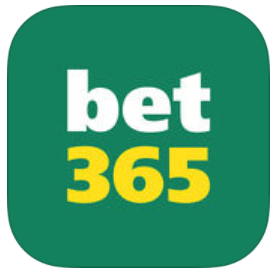 The other advantages of Bet365 include one of the best live consoles, live streaming, superb mobile apps, and the constant strive for new features. To use the Live Streaming service you will need to be logged in and have a funded account or to have placed a bet in the last 24 hours. 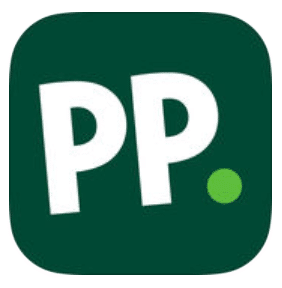 Paddy Power has a rich history and all the traditional features of an online bookmaker. The list includes an endless list of sports offered, solid odds, and cool promotions. Where the Irish giant really shines are the unconventional offers and markets you will often find there. In fact, some of the betting options at Paddy Power are borderline crazy and unique for the online market. Ladbrokes is another sportsbook that has been around for ages and started as a brick-and-mortar gambling operator. It went online almost two decades ago and was an instant success. The platform of Ladbrokes is still going strong today. The main reasons for that are the quality service, loads of sports and markets, and the juicy promotions available to both new and existing customers. Register today with the promo code LBMAX.